A couple Fridays ago, Tyson Ross took a no-hitter against the Diamondbacks into the eighth inning. It was complicated, even as no-hitters go — no-hitters are special, and the Padres have never thrown one, but it should also be more about the team than the player. On top of that, Ross was allowed to throw 127 pitches, and he’s a guy with a record of arm problems. Even going into the eighth, Ross completing the no-hitter seemed highly unlikely. You could argue, if you wanted to, that Andy Green took too great of a risk. Over the course of that dominant start, Ross racked up ten strikeouts. And as long as we’re here, let’s consider that record of arm problems. Ross had a miserable 2017. That followed a differently miserable 2016, in which he was able to make only one start. What that would suggest is that, these days, Tyson Ross might be fragile. On the other hand, what if he’s not? What if he’s actually all the way better? Because it’s looking to me like Tyson Ross is all the way better. Prior to 2016, Ross’ arm had been fine. Never encountered any major obstacles. Then he started to experience a constellation of symptoms, which eventually led to surgery in October to address thoracic outlet syndrome. TOS surgery is far less common than, say, Tommy John surgery, but the sample of major-league patients seems to grow by the year. Which means it’s becoming increasingly understood. Some pitchers have had trouble coming back, like Chris Carpenter, Matt Harvey, and Carter Capps. Other pitchers have returned and basically looked like their previous selves, like Chris Young, Jaime Garcia, and Clayton Richard. Matt Harrison had his best seasons after having the procedure. It’s a mixed bag, but the operation clearly holds promise. Injured pitchers have been able to recover their talent. Tyson Ross is looking like one of those fortunate pitchers. For a time, he wasn’t. Over 49 innings last year with the Rangers, Ross finished with more walks than strikeouts. It was because of that performance that the Padres were able to sign Ross to a minor-league contract with a bunch of incentives. The Padres were rolling the dice on the idea that maybe Ross just needed another offseason to recover. It’s been like night and day. Ross says he’s feeling freer than ever, with everything now back in sync, and there’s no arguing with what Ross has been able to do. The velocity looks a little bit different. The position on the mound looks a little bit different. The fastball mix looks a little bit different. But overall, Tyson Ross is Tyson Ross again. He’s doing Tyson Ross things, and he’s doing them with that Tyson Ross slider. 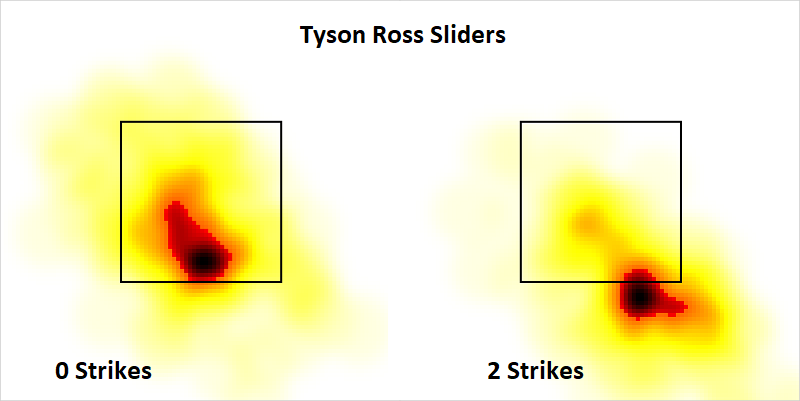 Perhaps you’ve forgotten about the Tyson Ross slider. Before there was so much talk about Rich Hill, and before there was so much talk about Lance McCullers, there was Tyson Ross. Ross leaned heavily on his slider, and he did so because his slider was one of the single best pitches in either league. As you know, we have pitch-type run values included among our leaderboards. I looked at all pitchers covering the three-year span from 2013 through 2015. There were exactly two pitches more valuable than the Tyson Ross slider, and those would be the Clayton Kershaw fastball and the Cole Hamels changeup. Ross’ slider, at his peak, was something sensational, something unhittable. It’s back, and if anything, Ross is now throwing it with even more conviction. That current slider rate would be a career high. And while it would be one thing if Ross just targeted the same spot over and over and over again, he’s better than that. What he does with his slider is determined in large part by the situation. Something you frequently hear from pitchers about their best pitches is that they’re more than just one pitch. Hill and McCullers have multiple curveballs. Corbin has multiple sliders. Ross, too, would say he has multiple sliders. Maybe it’s more like a slider somewhere along a broad slider spectrum, but Ross has sufficiently good feel for the pitch that he can add and subtract, and move the ball around. A batter, then, can’t just stand in and prepare for one slider in one area. When you look at Ross’ profile, you might think it would be easy to guess slider or sit on a fastball. Very obviously, facing him is far more complicated. His slider is a gift, and now that he can throw it again with a healthy and comfortable arm, it’s taken him little time to re-establish himself as one of the better starting pitchers around. In part, this is a tale of recovery. Of personal struggle and personal triumph, after a full two years of not feeling right. Ross was faced with an unusual diagnosis, and in the initial aftermath, it looked like he would never be the same. You could forgive Ross if, last offseason, he might’ve lost some of his faith in himself. Even the Padres weren’t sure what they might get in the spring. Ross was a total unknown. This was only one of several possible outcomes. And then in part, this is a tale of further intrigue. See, the last time the game had a healthy Tyson Ross, he was mentioned in trade rumors seemingly every week. An incredible number of those rumors would always link Ross to the Cubs. The Cubs have changed, and the league has changed, but Ross — Ross appears to be Ross once more. And he’s playing on a cheap one-year deal, for a team that isn’t going to sniff the playoffs. There’s always still more to prove, but Ross isn’t only back to being a good pitcher. He’s also back to being a valuable trade candidate. In baseball, some things old are new again. We hoped you liked reading Welcome Back, Tyson Ross by Jeff Sullivan! Ross looks like a guy who could throw 100 if he exerted a little more effort. Pretty easy mechanics. I exude more effort in my mechanics throwing darts at the pub – with less accuracy – than he does throwing his slider. harness his natural strength. Some pitching coach and Ross himself spent a lot of time working on mechanics.